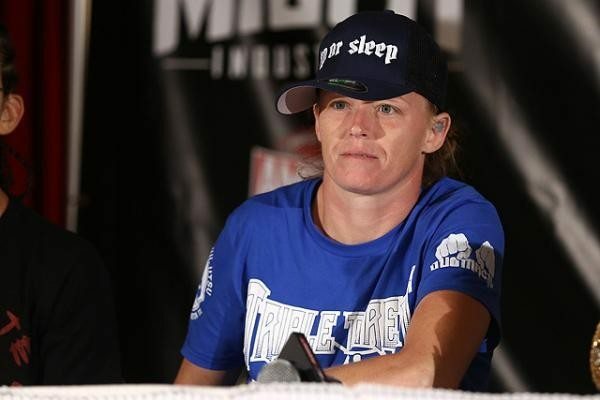 Invicta FC bantamweight champion Tonya Evinger has spoken out about agreeing to fight the most feared women in MMA, Cris ‘Cyborg’ Justino for the vacant featherweight title on just a months notice at UFC 214. The 36-year-old Evinger is a season veteran with a 19-5 (+1nc) record, who is currently riding an 11-fight winning streak – eight of those while competing for Invicta FC, and as such she’s confident that she’s going to be a much tougher test than ‘Cyborg’ is used to. Evinger is a unique character and tough as old boots, so despite some voicing concerns about her moving up to featherweight to face a monster like ‘Cyborg’, despite having fought as low as flyweight in the past, ‘Triple Threat’ wasn’t about to pass up on such a big opportunity. “You know what? I’m not a puss,” Evinger told MMAfighting.com. “I know it’s a struggle to get to 145 for her. I know what it is. It doesn’t matter, man. I’ll go home and I’ll regret this for the rest of my life. ‘I could have beat her, maybe. I don’t know. Maybe I should have took the fight. Why was I such a puss?’ I was scared to fight at 145? That’s not me, man. I’m not saying I’m gonna go out there and fight at 170 pounds tomorrow or the next fight or anything like that, but  is realistic. This ain’t too far off.